Manufacturer of a wide range of products which include pregazeal 150 mg capsules, lobac 25 mg, maxtan 10, omnigel cream, relaxyl ointment 30 mg and etocox 120 mg.
Pregalin 150 MG Capsule is an anti-epileptic medicine used for the treatment of certain types of seizures. It is also used to relieve pain associated with nerve damage caused by conditions such as diabetes, certain viral diseases, and fibromyalgia. We are bulk supplier, exporter & dropshipper of Lobac 25 mg tablet to USA, UK, Russia, and many other countries. 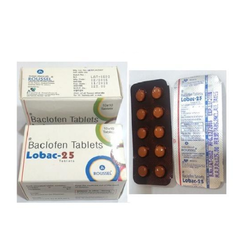 Baclofen is a muscle relaxant and antispastic. It is used to treat spasms in patients with MS (multiple sclerosis) or spinal cord disease. Muscle relaxant is a term usually used to refer to skeletal muscle relaxants (drugs), which act on the central nervous system (CNS) to relax muscles. We are bulk supplier, exporter & dropshipper of Maxtan 5/10mg tablet to USA, UK, Russia, and many other countries. Maxtan is in a group of drugs called nonsteroidal anti-inflammatory drugs (NSAIDs). Maxtan works by reducing hormones that cause inflammation and pain in the body. 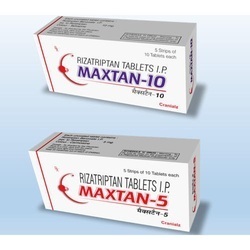 Maxtan is used to treat pain or inflammation caused by arthritis. It is also used to treat menstrual pain. OmniGel cream is used for Rapid Pain Relief Cream for Muscles aches, Joints Care, Backaches, Sprains and non-serious Arthritic pains. Omnigel cream blocks chemicals that cause pain and swelling.Omni Gel is a medicine that is used for the treatment of Back Pain, Pain In Muscle Strains Or Sprains, Pain In Arthritis, Migraine, Bone Fractures, Joint Pain and other conditions. Omni Gel contains Diclofenac, and Menthol as active ingredients. Omni Gel works by blocking the production of a chemical causing pain, fever, and inflammation; temporarily relieving minor pain. We are bulk supplier, exporter & dropshipper of RELAXYL 30GM OINTMENT to USA, UK, Russia, and many other countries. 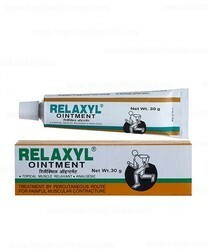 Relaxyl Ointment is used for Muscle or joint pain, Joint pain, Muscle cramps, Ache, Sprain, Backache and other conditions. Etocox 120 Mg/ 60 MG Tablet - Uses, Composition, Side Effects and Reviews Etocox 120 Mg / 60 MG Tablet is prescribed for the treatment of joint pain, joint swelling, muscles pain along with several other problems. 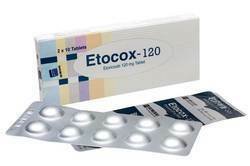 Etocox 120 Mg / 60 MG Tablet contains the salts Etoricoxib as active ingredients. Cobix is available in powers 100mg and 200mg . 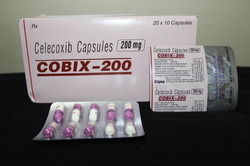 It is a non-steroidal anti-inflammatory drug, prescribed for rheumatoid arthritis, osteoarthritis, ankylosing spondylitis, juvenile arthritis, menstrual pain, and other pain.Cobix blocks chemicals that cause pain and swelling.Cobix is a pain killer belongs to a category of drugs called as COX-2 inhibitors. Angistat 2.5mg tablet reduces the workload of the heart. As a result, the heart muscle does not need as much blood and oxygen supply. 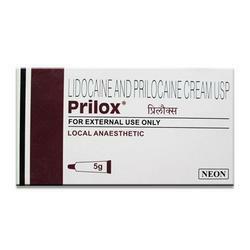 Prilox Cream contains Prilocaine which is used as a local anesthetic during superficial minor surgery and medical procedures.Prilox is used as a local anaesthetic. Injectable form is used in dentIstry and intravenous regional anaesthesia. Prilox(Prilocaine) is a local anaesthetic of the amide group. It has similar anesth potency to lignocaine but it has slower onset of action. S-adenosylmethionine is a naturally occurring compound. It works by helping to balance chemicals in the brain and reducing inflammation in the body.Relieving pain and inflammation in arthritis, treating depression, and for liver health. It may also have other uses. Check with your pharmacist for more details regarding the particular brand you use. Thiamine Hydrochloride Injection is used to treat or prevent a lack of thiamine (deficiency) when the form taken by mouth cannot be used or would not work as well as the injection. Thiamine is a B vitamin that helps your body to use carbohydrates for energy. It is also important for normal function of your heart, muscles, and nervous system. Most people get enough thiamine in their diet, but certain health conditions (e.g.,alcoholism, poor nutrition, pregnancy, stomach/intestinal diseases) can cause a deficiency in thiamine. 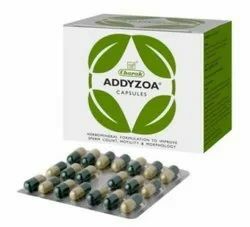 Addyzoa 20 Capsules Addyzoa Capsules is Charak's propriety ayurvedic medicine which is extremely useful in the treatment of infertility or sterility. It has eastern herbs which are known to increase the and also reduce the number of abnormalities associated with the . Thus, it improves the quality and increases the quantity of the seminal fluid. It also stimulates the secretion of by the testes and thereby stimulates the libido too. It helps to improve memory, retention power and intelligence, when applied over scalp and forehead. 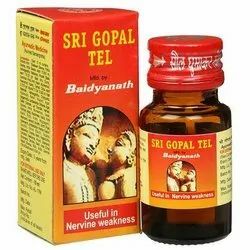 It helps to strengthen nerves, muscles and blood vessels, hence it is sued in diabetes, Vata diseases (neuro-muscular diseases). Ventolin (albuterol) is a bronchodilator that relaxes muscles in the airways and increases air flow to the lungs. 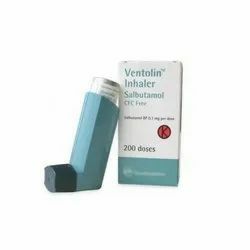 Ventolin HFA is used to treat or prevent bronchospasm in people with reversible obstructive airway disease.Ventolin is a short-acting ß2-adrenergic receptor agonist, prescribed for asthma. Ventolin relaxes the smooth muscles in the airway, which allows air to flow in and out of the lungs more easily. 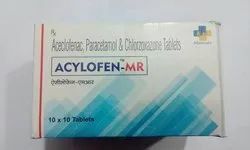 we are bulk supplier, exporter & dropshipper of Gabatop 600mg (Gabapentin) is an antagonistic to epileptic arrangement, moreover called an anticonvulsant. 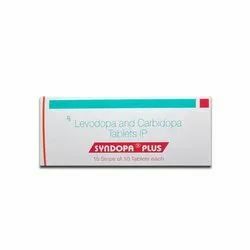 Levodopa is used in the treatment of Parkinson's disease. Levodopa works by being converted to dopamine, a chemical messenger that is needed to control the movement through transmission of signals in the brain. 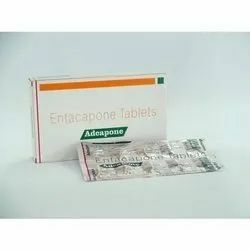 Adcapone Tablet is used for Parkinson's disease and other conditions. 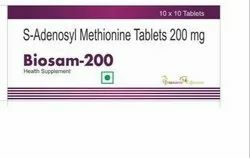 Adcapone Tablet may also be used for purposes not listed in this medication guide.Adcapone Tablet contains Entacapone as an active ingredient.Adcapone Tablet works by inhibiting catechol-O-methyltransferase activity.Sun Pharma manufactures Adcapone Tablet. Rasagiline is used along with or without levodopa to treat Parkinson's disease (nervous system disorder characterized by slow movements). Rasagiline belongs to class of medicines called monoamine oxidase B inhibitors. It works by increasing certain chemical substances in the brain (dopamine) which is responsible for movement related function of the body. 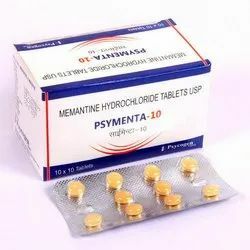 Description: Ropark Tablet is used alone or with other medications to treat Parkinson's disease. Ropark Tablet can improve your ability to move and decrease shakiness (tremor), stiffness, slowed movement, and unsteadiness. Ropark Tablet may also decrease the number of episodes of not being able to move ("on-off syndrome").Ropark Tablet is also used to treat restless legs syndrome (RLS). Ropark Tablet may improve yoursleep by decreasing the urge to move your legs and decreasing uncomfortable/unpleasant feelings in the legs. 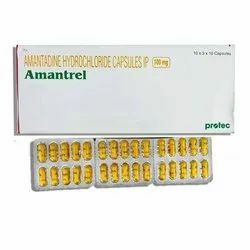 Amantrel 100mg capsule works by increasing the amount of dopamine, a chemical messenger that is needed to control movements in the brain. 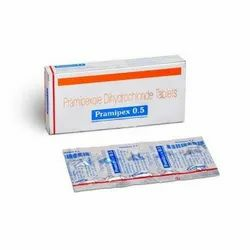 Pramipex Tablet (Pramipexole) is a agonist of the non-ergoline class indicated for treating Parkinson's disease and restless legs syndrome.Parkinson's disease is a neurodegenerative disease affecting the substantia nigra, a component of the basal ganglia. The substantia nigra has a high quantity of neuroNS. 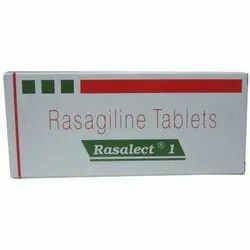 Rasalect Tablet is used for Parkinson'S Disorder and other conditions.Rasalect Tablet contains Rasagiline as an active ingredient.Rasalect Tablet works by preventing the virus from reproducing in the body. 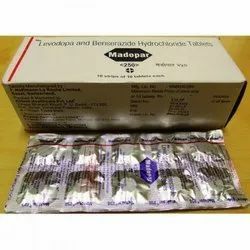 Madopar belongs to a group of medicines called antiparkinsonian agents and is used for the treatment of Parkinson's disease. Antiparkinsonian agents work on the central nervous system.Antiparkinsonian agents work on the central nervous system. The symptoms of Parkinson's disease are caused by a deficiency of a natural substance in the brain called dopamine. Madopar helps to replace this substance. By improving muscle control, Madopar allows more normal movements of the body.The symptoms of patients suffering from Parkinson's disease can be reduced by taking this medicine. Sensa Forte Capsule contains Ashwagandha, Gokharu, Jaiphal, Kaucha, Makardhwaj, Suddha Shilajit, Suvarna Bang, Vidarikand, and Yestimadhu as active ingredients. Attentrol contains Atomoxetine Hydrochloride (Attentrol Capsules) is used for treating attention deficit hyperactivity disorder (ADHD). 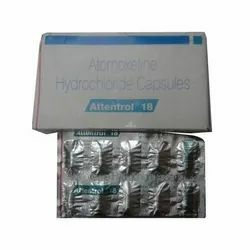 Each capsule of Atomoxetine (Attentrol) contains atomoxetine HCl equivalent to 10MG, 18MG, or 25 mg of atomoxetine. 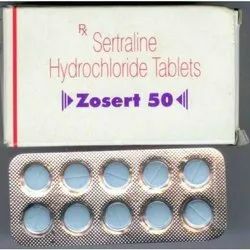 Zosert 50 Mg Tablet is prescribed for the treatment of depression, mental disorder, premenstrual dysphoric disorder along with several other problems. Zosert 50 Mg Tablet contains the salts Sertraline as active ingredients. It is available in tablet form. 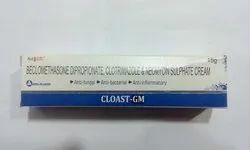 Features Hyaluronic acid sodium injection. 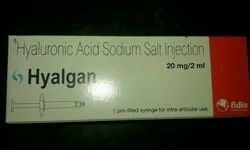 We are the prominent exporters of Hyaluronic acid sodium injection. It is herbal pain reliever oil. 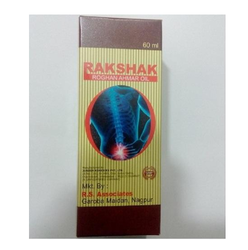 rakshak ( Roghan Ahmar Oil). 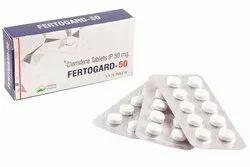 Fertogard-50 is used to treat infertility in women who are not ovulating properly. Ovulation (the release of eggs) is in part controlled by hormones, called gonadotrophins, which stimulate the activity of the ovaries. The gonadotrophins are made by the pituitary gland, pass into the bloodstream and then travel to the ovaries. Fertogard-50 works by blocking a feedback mechanism to the pituitary gland. This results in the pituitary making and releasing more streroid than normal. The extra amount of gonadotrophin hormones stimulates the ovaries to ovulate. Fertogard-50 is a non-steroidal fertility medicine.